For those already time-poor from managing a household, organising your move can be difficult to fit into your busy schedule. Fortunately, the team at Transcorp Removals & Storage can provide a range of useful services on top of ensuring your items arrive safely at their final destination. Take advantage of pack/unpack services to make your relocation to Sydney as easy as possible. Need temporary storage? No problem; we have the flexibility to suit your circumstance. If you’d like more information about our services or you need a quote for removalists from Perth to Sydney, speak to our friendly team today. Give us a call on 1300 466 838, request a quote using our easy online quote tool, or make a booking at your earliest convenience. You can also read some of our FAQs below. How Much Does It Cost to Move from Perth to Sydney? What Are the Moving Times from Perth to Sydney? Is Removalist Insurance a Good Idea? Can You Help Me Move My Vehicles? Do You Offer Interstate Pet Transport? Can You Pack and Unpack My House? What If I Need Short Term Storage – Can You Help? Can You Move Plants Interstate? Because we understand moving can be an expensive endeavour for some, we make our prices as transparent as possible to help you properly budget for your move. To receive an accurate quote for your move, try our online interstate move cost estimator today. This simple removalist calculator can be used to work out the approximate price of your relocation from Perth to Sydney. The approximate travel time from Perth to Sydney (either way) is 10 to 21 business days. If you think storage may be needed, please let us know. We additionally provide removalist services for all cities located between Perth and Sydney. 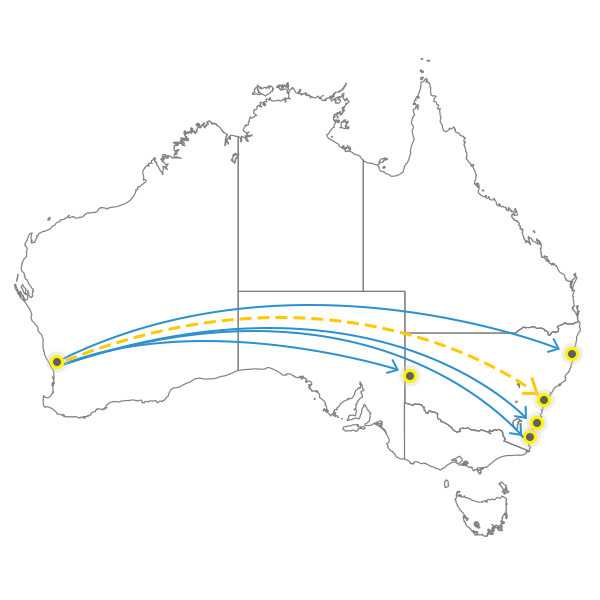 Our Perth to Sydney transit times are based on consolidation of loads (Backloading). These times are subject to change with the volume of removals performed. If your interstate move is urgent, we can provide you with an exclusive vehicle or removal container upon request. A local removal truck or shuttle van may be necessary for areas with difficult access. Please inform us if this is the case. Yes, removalist insurance is generally a good idea for all moves to ensure your belongings are protected, giving you ultimate peace of mind. While it may not seem like a necessary expense, we urge all of our customers to consider purchasing insurance for accidental damage and theft. Speak to our friendly team today to obtain an accurate removalist insurance quote. Yes, we can help with all your storage needs for furniture and other belongings. In addition to short term storage, our secure storage facilities also cater for medium and long term storage. Request a competitive quote for our interstate storage today.